There is no better way to go into the weekend than with talk of good eats and fine dining. Since ancient times people come together to break bread. Eating with company, family, etc. is one of my favorite pastimes, sometimes surpassing the actual food I'm eating. But being as I am married to an amateur chef (who I feel needs to go pro) and have been sampling restaurant fare for as long as I can remember, it would only make sense that I would take note of all the food available to me during my recent trip to the Islands of the Bahamas. Conch Fritters. This island delicacy is a sinfully light "pastry" that is packed with green and red peppers, conch (an island shellfish that is THE island shellfish), garlic and spices, the spicier the better. It comes with a dipping sauce that can be best described as a spicy ranch sauce that adds that much more punch to the already unique flavor. Conch (pronounced "Conk" like honk) in my opinion, tastes however it is flavored and it is fantastic when embedded in these Bahamian-made fritters. 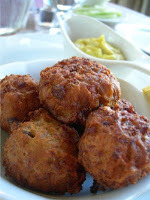 During my stay, conch fritters were served as appetizers at nearly every meal short of breakfast. Grouper. It is amazing that such an ugly fish can taste so good. I guess you can't judge a grouper by it's grill. This is a fish you have to cook carefully because it turns tough/gamey pretty quickly (like overcooked chicken or beef). You know you've got a good selection when it is taut but flakes off as you eat it. I first had grouper as a grilled filet with fries in Antigua several years ago. In the Bahamas I ordered it every chance I got, typically with fries but also with grilled veggies similar to the image to the left of the immediate left of this paragraph. One of the main reasons I want to retire in the Caribbean is based on what appears to be the constant state of calm and relaxation, experienced by the locals, not the tourists. In all my travels restaurant life as hectic as it may be behind the scenes is about as calm and serene as it gets in the islands with patrons spending no less than an ninety minutes eating, drinking and being social --- they way it ought to be. 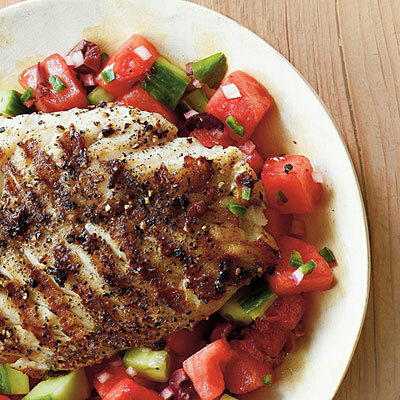 There are some times when you begin to wonder if your food is actually coming out (after all no one is perfect) but once it does arrive you'll have no worries that it's hot and fresh. Café Matisse. Centrally located, just behind Parliament Square, Café Matisse claims itself to be "the most picturesque Italian restaurant Nassau has to offer." The walls are lined with Matisse prints (took me a minute to connect the name with the artwork, duh). 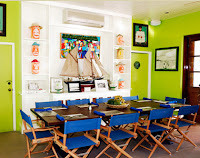 It also happens to be a favorite eatery of our elegant guide, Anita of Bahamas Tourism. I sat with my group around a large round table in a very cozy corner of the restaurant and feasted on wild salmon with a ginger, balsamic reduction on a bed of spinach. We ate, we drank (water mostly, because it was so hot outside) and laughed the afternoon away. The service was a little on the slow side, but remember what I said about hot and fresh food. Sip Sip. This ocean-side eatery is named for Harbour Island's slang for gossip. And let me tell you, you can sip sip for hours at this intimate, open-air establishment. I love the fact that the primary mode of transportation on the island is the golf cart. I didn't like that they were gas and not electric, but hey on occasion you have to swallow a bit of bad in order to savor the total good. It has a 4.5 star review on Trip Advisor and is a Fodor's Choice so you don't have to take my word for it. Should you ever visit, make sure you start with a plate of hummus and pita bread and definitely try the lobster quesadilla and the gourmet cheeseburgers. Notice, I said, "and." Lastly, the passion fruit sangria might possibly be the best sangria I've ever tasted. Let me disclose here, that I haven't indulged in every sangria known to man, but I've enjoyed a few. 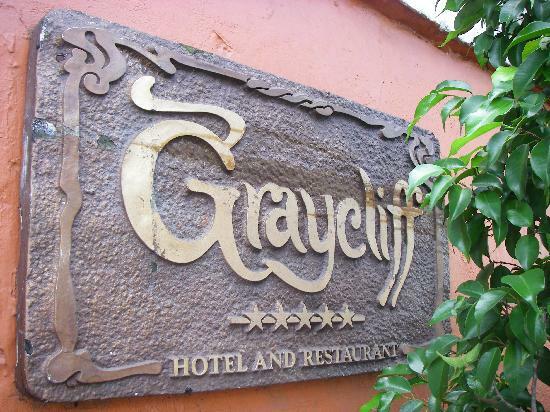 The Graycliff. 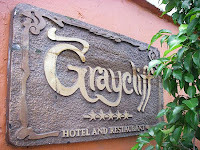 Set apart from all the rest of the establishments I had the honor of visiting, the Graycliff is the only 5-Star establishment on the island and the first in the Caribbean. The second I walked through the tall wooden doors of it's entrance I knew right then and there I had stepped into another time, another world, perhaps and I knew for certain I was rubbing elbows with the well-to-dos who far outpace me in income. The likes of Tom Cruise, Jay-Z, Nicolas Cage and Lebron James have dined in seclusion here during their visits to the island. The restaurant has two sommeliers who are diligent and knowledgeable stewards of the wine in the cellar beneath the restaurant, with over 250,000 bottles valued at $20 million and housing what is currently the oldest bottle of wine, that hasn't yet been consumed. The restaurant mixes Bahamian specialties with European cuisine. Dress is elegantly casual. The sounds of laughter and piano drift casually throughout every room in this historic mansion that dates back to the 18th century that is also a hotel that houses twenty guest rooms and spacious suites. In the video below you'll see photographs of dishes I ate at and where I at them? Can you spot the amazing cheeseburger with mushrooms from Sip Sip? Will you catch the salmon filet I scarfed down while socializing at Café Matisse? Also check out my Instagr.am pic of a corner in Graycliff's wine cellar. Did you see? Please, let me know in the comments below. Disclosure: My Bahamian adventure was provided courtesy of the Bahamas Ministry of Tourism. The thoughts and opinions expressed in this and subsequent posts and videos are wholly my own.